Hybrid devices with dockable keyboards are eating into the tablet and PC markets. Tablet sales and prices have been dropping off with a couple of exceptions. 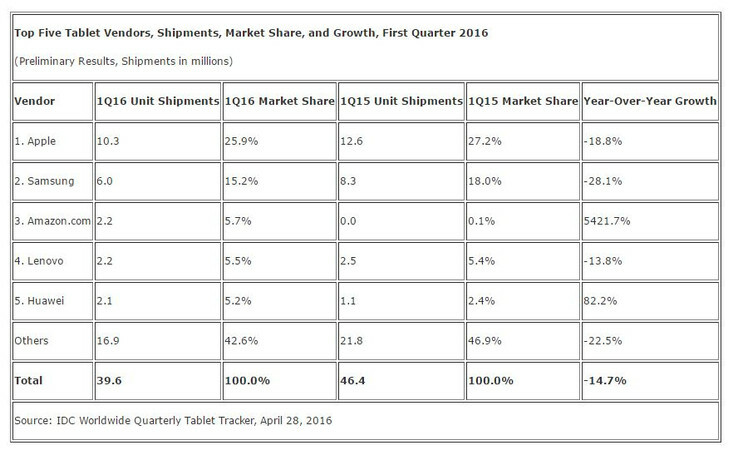 Compared to Q1 2015, worldwide tablet sales as of Q1 2016 have dropped from 46.4 million units to 39.6 million units. Amazon jumped to the top 5 list of largest tablet manufacturers due to its family of very inexpensive Fire devices. Together with Huawei, these two companies are the only ones on the list who experienced an increase in tablet sales YoY. Apple. Samsung, and Lenovo were down -18.8 percent, -28.1 percent, and -13.8 percent, respectively, with other manufacturers collectively down -22.5 percent. According to IDC, the market is growing for 2-in-1 detachables. While "pure" tablets still account for the the bulk of the sales at 87.6 percent, sales of 2-in-1 models are increasing dramatically. IDC analyst Jitesh Ubrani claims that the Microsoft Surface series has created a new market where powerful detachables are becoming viable alternatives to traditional desktop PCs and notebooks. 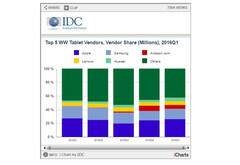 Larger tablets like the iPad Pro are accounted for by IDC despite the fact that it carries a mobile operating system. Standalone tablets are becoming more of an entry-level option for users. The news comes after the fact that the traditional notebook market has been stagnant even after the launches of Intel Skylake processors and the lauded Windows 10 OS.